WARNING ABOUT TIS-SA-ACK: Brandon Adams and I attempted to push Tis-sa-ack today. While Brandon was leading the 12th pitch (which is positioned on a giant exfoliation flake) we heard rock popping and cracking. The whole feature began shuddering. The end of the pitch (formerly C2 thin) is now a 3” crack and the pitch above (formerly a 3” crack) is now 9”. We bailed as quickly as we could and we strongly feel the whole 100m x 50m flake is about to come off. Climb Tis-as-ack only if you want to get REALLY rowdy. Be warned. As of 8/29/2014, all bolted anchors are solid. All gear/piton anchors are still gear/piton anchors, as shown on the topo. Most of the bolt ladders have at least one or two solid bolts (with the exception of the ladder on P8). Thanks to Roger and ASCA for providing hardware and advice! We placed 13 anchor bolts, 5 lead bolts, and one rivet. All lead bolts were 1-for-1 replacements of existing [sketchy] lead bolts. Anchors were cleaned up and are generally one bomber ASCA, plus one or two more moderate to good bolts. In general, the climbing is fun and adventurous with occasional loose rock, exceptional position, and good times to be had! If you want more beta, feel free to find us and ask, or PM! Anyone been on this lately? What are the route conditions this year? Must be fun climbing that thing after I pulled out alot (dozen or two) of fixed pins,rurp and couple aliens. Specially the visor. I think that was in August or September of 2005 perfect for the hot baking valley down below. Except the belay pins and the Z-tons that got stack on the flake I cant remember. And rock fall or rockslide on the slab below are grinding mad all night. Due to the storm. I was on the twilight ledge for the entire day doing nothing except drinking tequila that Zack (Teacher Zack from L.A area) hand it to me in curry village while getting ready. Thanks Zack I really enjoy it! I think it's easier that Mescalito maybe not but the approarch fursure I give you the credit for it! Most of the anchors are marginal to down right bad, and need to be backed up. We added three 3/8'' belay bolts to some of the worser anchors, some anchors have good 3/8" bolts that need hangers so bring extra 3/8" hangers. Many of the lead bolts are barely hanging in there, so bring xtra bolts or rivets in case something blows. The old bolt ladders are in bad shape and scary. There is a fair amount of loose rock throughout, so be aware of that. I thought the climbing was a bit harder than say Mescalito, but the route is overall much more serious due to bad bolts, loose rock etc. I got a report from a party who just got off the route that the anchors were scary. You can read posts below that people feel the anchors are not that scary. 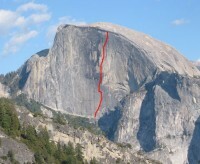 either way, it should be pointed out that the anchors are not as bomber as most popular el cap route. you wont find 3 bomber bolts at every belay and therefor you have to spend more time equalizing anchors and building natural belays. Also, i say that this route is easier than mescalito. the climbing maybe a little easier. however, my friends who just got off this route felt that because the anchors too more time to equalize... this made the route feel more challenging than mescalito. Just got off Tis-Sa-Ack with Erik and Mike. Three major rockfalls from the wall left of Bushido Gully scoured the slabs approach in one week, during our approach and climb. Second rockfall in this series was one of the most catastrophic falls in Yosie near history, with an area several hundred feet wide pouring out gigantic boulders for over half a minute. As the wall caved in over the broken sections we wondered if the collapse could work itself up to our position, and our anchor fall off the wall. We watched in horror from the middle pitches of the route as a shocking number of large boulders plunged intact all the way to the thick woods above Mirror Lake. Much of the crashing rock, however, pulverized near the base, looking exactly like roiling lava, then rapidly like a major snow avalcnche. Rock dust billowed up fiercely like Hell reaching for us, filling the entire bowl and rising above the summit, stranding us for about 5 minutes in a sunless whitout of rock grit. When it cleared, we saw what looked like snow covering much of the trees in the bowl, a vast area. The slabs were broken and new rock strewn everywhere, with many boulders still toppling as they sought balanced resting spots. We were spitting out rock and brushing fine white grit off our gear and out of the inside of bags hours later. Anyone on slabs approach would have surely been killed or desperately injured. Helicopter was on scene within half an hour, responding to the great dust cloud visible anywhere in the Valley. It seems nobody was in the path of this catastrophe. Fixed ropes must have gotten mangled. Approach unstable. Small rockfall the next day confirmed my feeling that the cliff has been massively destabilized. Advise Mist Trail or Muir Trail approaches for Half Dome. I thought every anchor was adequate-- most were ancient quarter-inchers supplemented with newer, occasionally larger, bolts. I never felt worried about them, and never got the drill out. The rivet ladders up high are impressively haggard. They all held, but. The museum value is pretty high up there. As long as they keep holding, I think it's cool to climb on Robbins' bolts. Save the stainless for someplace else, Erik! I belayed prematurely on pp 4, 10, and 14. Many pitches are longish, for 1969, and all anchors look like anchors-- they have stances, and fixed gear. Hold out for these! P1 is C1, and a #4 camalot is useful. The tail from a 60m rope can be rapped back to the ground after the line is fixed. I followed on prussiks, since it's a dead-horizontal traverse. P3 bolt is quite geriatric, and important. Public service, anyone? p5 Wear free shoes; gear to 4.5". "C2 loose"= fun free flakes. P10 I stayed left, up a clean, steep corner and across under the big roof at C1. No scary reaches. Rad free potential here. Good shelter. P13 Ignore second rivet ladder. Save a 4 camalot for the end. P15 The "C1 awk" is an acute squeezer, followed by a C1 corner. Think free. p17 The Ramp. Skip Cave belay; save some brass for the C3 above. Kali Yuga junction roof would be great in a storm. P21 Free at 5.10 after short C3; hands in a corner. P22 Nothing you read here will matter anyway. A maze. Good anchor bolts on the right topout, by yellow tat. P23 real rubber underfoot will save you some trauma. The rack: The Supertopo pin list is overkill. I used a Bugaboo, a long thick LA, a short thick LA, the smallest Leeper Z, and a shallow angle (Lucky). No heads, no rurps, no beaks, no sawed-offs. The Leeper and the short thick saw the most action, which totalled 10 placements, most of whch were on the last pitch where I wasn't into dicking around anymore. The only heads are also on the last pitch; there's 2 or 3,and they look fine. The route has gone clean. One set of hooks is just fine-never 2 in a row. A big 'ol hook is especially useful; don't forget that one. Techy tiny clean gear was real handy. No real expando, as long as you have those springy things. Any new word on anchor conditions on Tis-sa-ack?